Just what is “Amanuensis Monday?” An amanuensis is a person employed to write what another dictates or to copy what has been written by another. I’m not employed but by you, my dear reader, and will use the occasional Monday to transcribe family documents. Transcribing forces me to make a very close reading of the text, thus perhaps showing some detail I may have otherwise missed. When printed on the blog, it makes information more findable for search engines and others interested in the same topic. One way to easily learn about the last years of an ancestor is to read their last will. 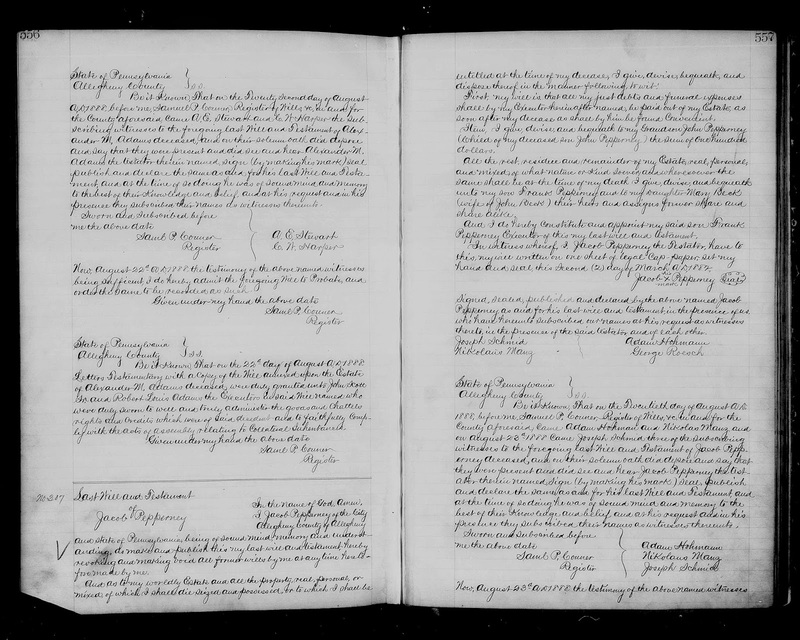 Many are available online and recently I was able to locate the will of Jacob Pepperney, my 4th great grandfather. Jacob was born in in or near present-day Austria in 1805. He died in Allegheny (present-day Pittsburgh), Pennsylvania on August 15, 1888. One of his last acts before his death was to have drafted in his name a last will and testament. This document is available through the records of FamilySearch and is itself a transcription. Instead of keeping thousands of wills and testaments in different formats, entire probate records were transcribed into journals for record keeping. This ensured a more complete record that was uniformly organized. I’ve transcribed the transcription. While nothing earth-shattering – Jacob wasn’t bequeathing any family treasure – it does show that he left a small sum to his grandson whose father died a few years prior. The details are below; I’ve transcribed it as best I can but apologize in advance for any errors. soon after my decease as shall by him be found convenient. Pepperney Executor of this my last will and testament. hand and seal, this second (2) day of March A.D. 1882.
thereto in the presence of said testator and of each other. Be it known, that on the twentieth day of August A.D.
presence they subscribed their named as witnesses thereto. order the same to be recorded as such. Be it known, that on the 23rd day of August A.D. 1888.
embly relating to collective inheritances. 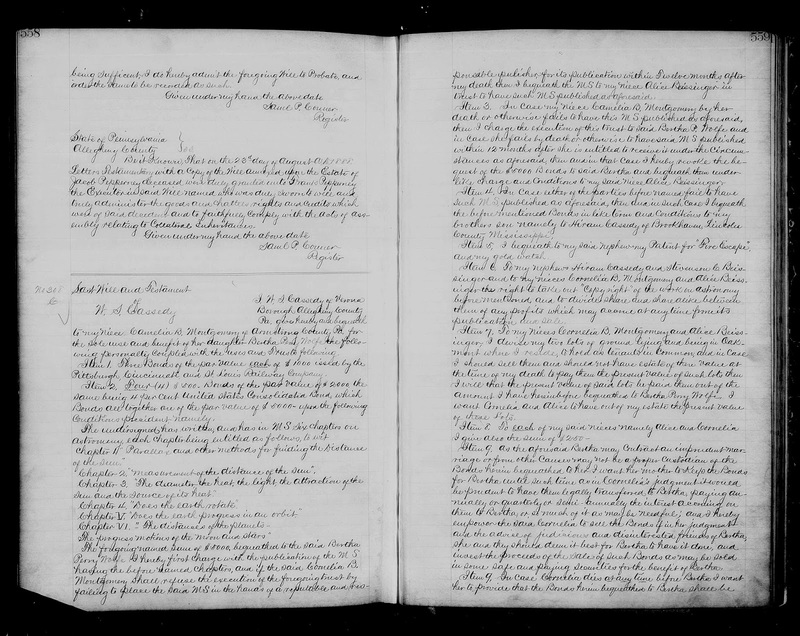 “Pennsylvania, Probate Records, 1683-1994,” images, FamilySearch (https://familysearch.org/pal:/MM9.3.1/TH-1971-28781-6621-99?cc=1999196&wc=MDSG-YWL:268499101,283261801 : accessed 03 May 2014), Allegheny > Wills 1887-1889 vol 33-34 > image 320 of 691.